Parasite of the Day: August 16 - Lernaea sp. "Ummm...you have something hanging off your gill..." says one fish to another. Could very well be an anchor worm, which is not a worm, but instead is a parasitic copepod. They begin life as free-living, but after the female mates, she burrows herself into the flesh of a fish and becomes a long worm-like creature (hence the name). These parasites can cause major problem for aquarium and pond fish such as goldfish or koi, both because of the damage they do burrowing in and back out and also because of promoting opportunistic infections. Photo is by Alaine Knipes. 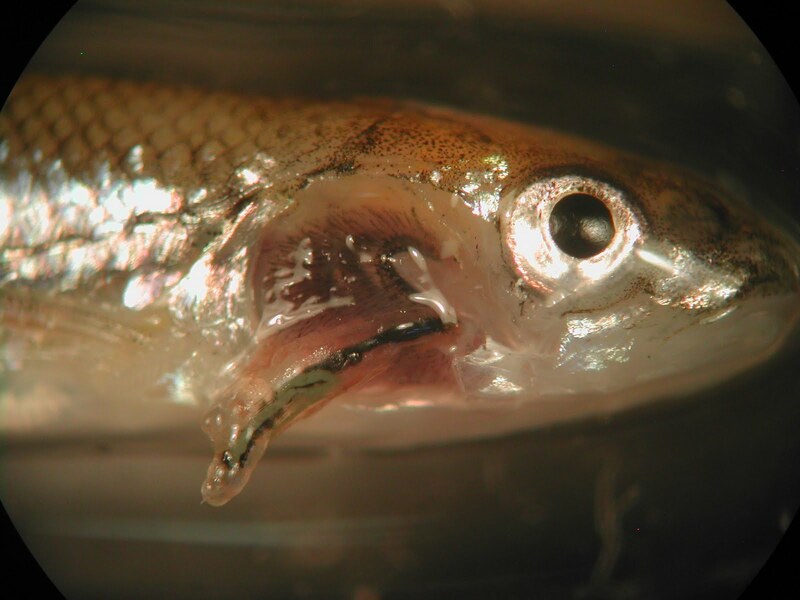 Check out this video of an anchor worm on a minnow that she made, too.